The MESA lineup features padding and softer fabrics for added style and comfort. In addition, through its innovative use of Merino wool in two fashions, the Henry and Jordan MESAs are the ONLY car seats to pass federal safety standards without the use of fire retardant chemicals. 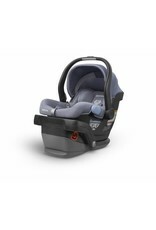 You can’t sell a car seat without it first passing Federal fire safety testing (FMVSS302 to be exact). While our MESA lineup meets flammability standards without brominated and chlorinated chemicals favored by traditional manufacturers, the innovative use of Merino wool in the Henry and Jordan MESAs take things a step further. The Henry and Jordan MESAs are the only car seats to pass rigorous fire safety testing without the use of fire retardant chemicals. Merino wool is finer and suppler than regular wool, and its natural flame resistance makes it a powerhouse. When exposed to flame, it resists catching fire, where artificial fibers may melt or burn. We can’t say enough good things about the Merino wool blend used in the Henry and Jordan MESAs. Its wicking properties help keep babies cool on hot days and warm on cool days. The Henry and Jordan MESA fashions are the only car seats to pass federal flammability standards without the application of chemical flame retardants. The Merino wool fabric used is OEKO-TEX® Standard 100 certified.